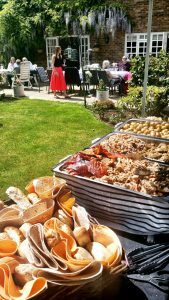 You will not find a more passionate, knowledgeable or experienced hog roast catering company than the Hog Roast Aylesbury team. We have spent the best part of 30 years catering for events across the whole of Aylesbury and whilst our unbeatable hog roasts will always remain at the culinary core at what we offer, we are continually diversifying our menus and service, enabling us to supply complete catering packages for all occasions, tastes and budgets. The increasingly varied requests we receive for our catering services are a testament to our ability to stay true to our roots, yet also provide imaginative, modern menus that will compliment your event perfectly and meet the needs of any dietary requirement. The secret of our success to due to 3 key factors: the skills of our chefs, the superior quality of our equipment, and our exclusive use of locally-sourced, seasonal ingredients. We never cut corners in any aspect of what we do and every dish we provide in freshly prepared by us at the venue. Our patient and instinctive catering team have perfected the art of slow-roasting meat and always give it the care and attention it deserves to achieve fabulous results every time. Our top of the range hog roasting machines are also capable of slow-roasting a range of other meats with an equally delicious outcome if you prefer an alternative to pork. All of our accompanying dishes are treated with as much consideration and are prepared on-site alongside the meat whilst it is cooking. Our organised team always plan very single aspect of the cooking process carefully to ensure all of the elements come together seamlessly, so we can provide you with a beautifully presented and complete meal at the exact time you wish it to be served. We have devised an extensive range of menus that are guaranteed to exceed your expectations, regardless of the setting, theme or size of your event. We can provide informal outdoor buffets where everyone helps themselves, classy 3-course wedding menus with table staff for a formal reception, canapes and welcome drinks for corporate events, or vegetarian and gluten-free options for christenings, anniversaries and engagements parties. The scope of our menus is varied enough to please everyone, and our service can be adapted to suit the style of your special occasion. We will always go above and beyond to give you the perfect meal, and from the preparation to the presentation of your chosen menu, we strive to make every single detail exactly how you want it. Call the team today to find out more about us! Copyright © 2019 Hog Roast Aylesbury . All Rights Reserved.